For several months in a row, I did some unboxing videos for Stash Builder Box. While I generally did like those boxes, there were usually a couple of items that I would not have chosen myself. That’s really the dilemma of subscription boxes: the surprise element. Unlike regular ‘ol shopping, you don’t pick out what you’re buying. If you’re not a fan of surprises or need to have complete control over your purchases, I do not recommend these to you. At all. So where were we? Oh yeah, my highly anticipated Quilters Candy Box. It probably arrived sometime last weekend, but I neglected to check our mailbox until Saturday. (Our subdivision has cluster-style mailboxes due to new USPS rules, and it’s down the street) Because I didn’t want to spoil things, I waited to open my box until filming actually started Sunday. Finally, by Sunday afternoon I had my new and improved camera gear all ready to roll with my hair and makeup done. Like a little kid on Christmas, I started rifling through the tissue paper to see what sweet treats were in my QCB. Quilters Candy Box offers a month-to-month subscription plan for $42.95 + shipping – which would be $10 delivered to the Atlanta area. This brings it to $52.95 each month. As you can see by my calculations, the subscription cost is about $16.35 lower than the total value of the items in the February 2017 box. I imagine this varies every month, depending on the box contents. 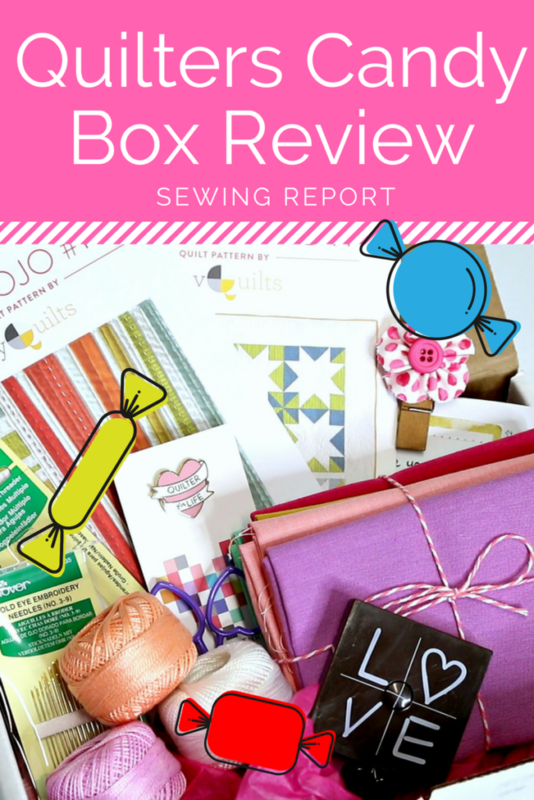 Is this the least expensive sewing/quilting subscription box? No, it is actually the priciest out of the four – including Sew Sampler Box, Quilty Box, and Mega Stash Builder Box. Unlike some of the other boxes, QCB does not offer a discount for a 3, 6, or 12 month subscription. That would actually be a great thing to offer to customers. When you submit your order, it does auto-renew, but I’d like to see an incentive for someone to prepay for a certain time commitment. When choosing a sewing/quilting subscription box, I would NOT recommend choosing one based solely on price. Instead, scope out previous boxes on websites/Instagram, etc. and pick out the one that has the most stuff you like. It doesn’t matter how great of a bargain something is if it’s not something you want and will use. Fabric especially is so subjective. If you prefer Cotton + Steel fabrics, you shouldn’t choose a box that has mostly Civil War reproduction prints. Every single item in my Quilters Candy Box spoke to me. It was packaged beautifully and it would have saved me at least $16.35 from purchasing everything individually. I noticed little details such as hand stamping, and even a HANDWRITTEN NOTE on delicately prepared card stock that was punched with a heart and had been stitched with a sewing machine for extra craftiness. Who does this anymore? The people behind QCB, that’s who! These folks are sending you a real quilty care package, obviously hand packed with lots of attention to detail. February’s theme was love, evident by the tiny little scissors with heart-shaped handles and a tape measure that quite literally spelled it out. The box contained almost everything needed to make Suzy’s Sew Mojo Mini Quilt #1, which I totally plan on doing! Out of all of the subscription boxes I’ve received, this one most closely matched my personal preferences for sewing and quilting supplies. These boxes do seem to sell out quickly, so don’t wait if you’re interested in the box of the month. You can get sneak peeks of the upcoming QCB on Instagram @quilterscandybox. Quilters Candy Box – you’re responsible for my new sweet tooth!